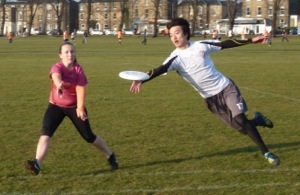 Ultimate is a fast-paced team sport played with a flying disc (frisbee). Although similar to sports such as American football and netball, Ultimate is non-contact and self-refereed. To compete at the highest level, Ultimate players require speed, agility and endurance. Yet beginners find the game easy to learn and fun to play. Grab a disc, get out there, and discover why many think this is the ultimate team sport. 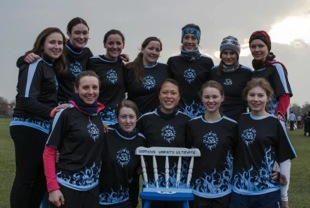 Strange Blue is the Cambridge University Ultimate Club. Our men's, women's and mixed teams compete at BUCS, Varsity and UK tournaments. We send both competitive and beginners squads to indoor and outdoor competitions happening year round. New faces are always welcome! Keen to learn more and see the game for yourself? Come along to one of our beginners' sessions! Both men and women welcome. Just turn up at the times above wearing clothes you can run around in, and bring some water and studded boots if you have them. We also hold separate women's practices throughout the year which are open to all, starting with the (warm and dry!) indoors session above. The Kelsey Kerridge Centre charges £1.20 entry fee. 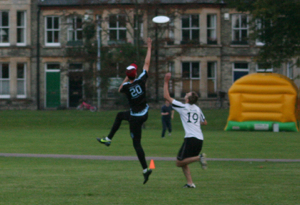 College league is a competitive but super-friendly league that runs throughout term time. It's designed to be fun and accessible to beginners, while providing an opportunity for intermediate players to work on a wide variety of their skills. Check for your college team here.